Spoiler alert: Except for a mention in passing, I didn’t touch the subject of Breakfast at Tiffany’s in Dutch Girl: Audrey Hepburn and World War II. The book focuses squarely on the war and defers on topics like the production of her films to existing biographies on the Hollywood years. 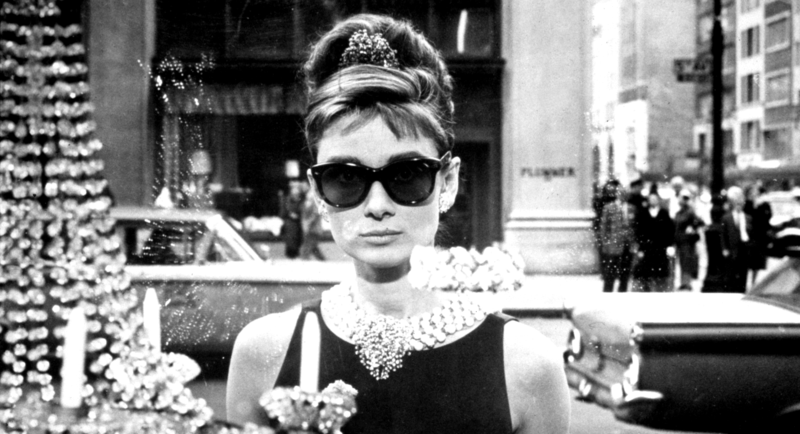 I first saw Breakfast at Tiffany’s long ago and wasn’t impressed. The other night it played on TCM/US and I watched it again, this time with knowledge gained after two years in close quarters with Audrey and an understanding of all she had seen and done during the war. The one sheet can fetch $15K, although usually it auctions around 5. 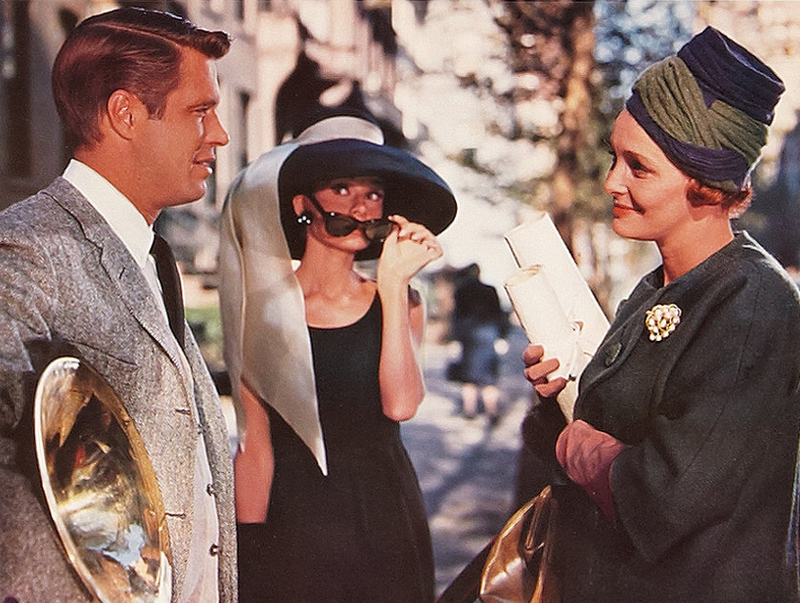 I remembered only two scenes from past viewings: That magnificent opening series of shots as the cab glides down deserted Fifth Avenue and deposits Holly Golightly in front of Tiffany’s for her impromptu opening-credits breakfast, and the scene near the end when she abandons Cat in the rain. I sort-of recalled being annoyed at Mickey Rooney’s portrayal of a Japanese landlord without remembering any of his scenes in particular, and I very vaguely recalled liking George Peppard as boyfriend Paul as much as I always like Peppard, which is to say, not at all. This time around I enjoyed Breakfast at Tiffany’s, and what struck me above all was Audrey’s luminescence cast against type as a gentleman’s paid companion—allusions to which are so vague it had to be explained to me, and only then did I start to notice the references, as when Holly peered in the window and saw Paul’s older lady-friend drop cash on his nightstand; a little later she told Paul that she understood his situation. Well, how did she understand? Because she was used to being paid to be various men’s girlfriend, content that strayed into the realm of pay-for-play and scraped against the waning days of Production Code censorship. 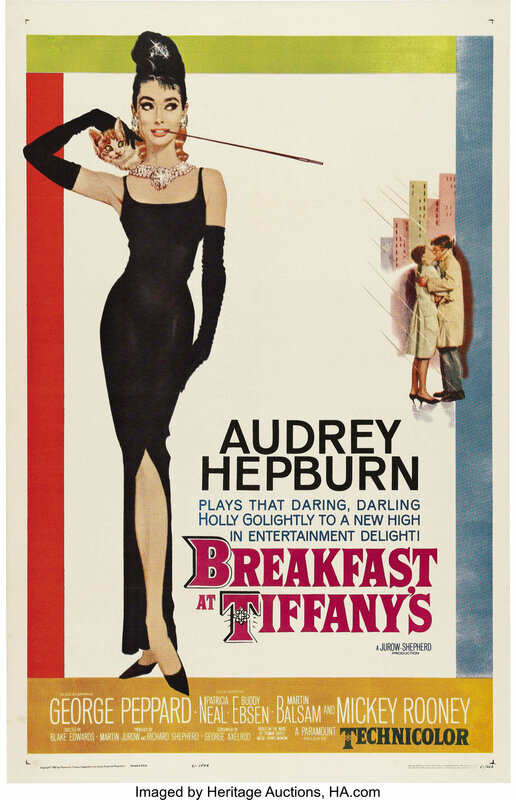 I now get why a Tiffany’s one-sheet movie poster sells for a consistent five grand and why this is Audrey’s iconic role. She’s mesmerizing—chic, poised, articulate, mysterious, always dressed to the nines but wearing the clothes not as clothes but as skin like she was born in it and born to do it. She had played the Pygmalion-ugly-duckling-turned-fashion plate twice already, in Sabrina and Funny Face, and by now was using hats, sunglasses, and cigarette holders in her performance like Astaire used lamps or coat racks as dance partners. Everything she did on film became suddenly cool. Even the highlights in Audrey’s swept-back hair hypnotized me. I did a little investigating afterward. Truman Capote wrote the story on which the film was loosely based. It first appeared in Esquire and the resulting sensation had Hollywood calling. Capote wanted Marilyn Monroe as Holly, and what a different film that would have been because there would be no doubt how Holly made money and why men were hanging around. 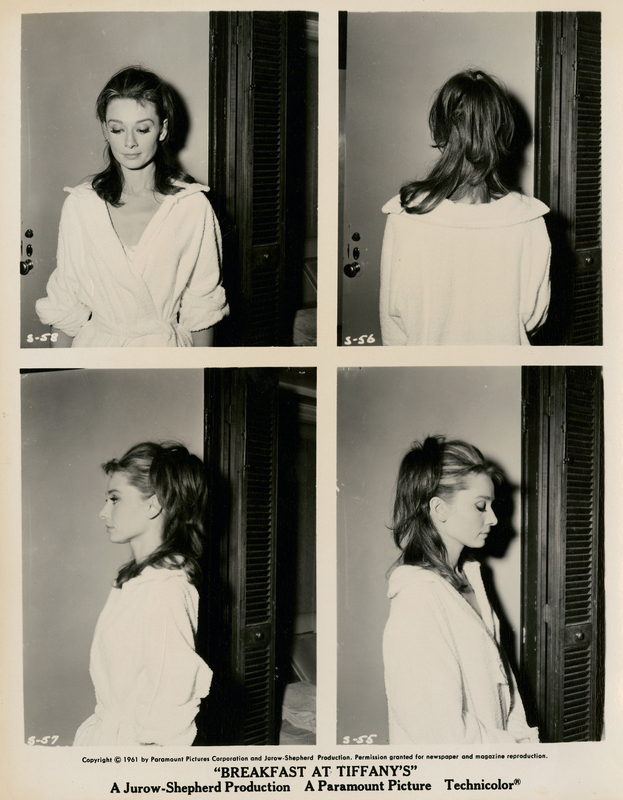 Capote vocally and loudly hated Audrey in the role because she spun it in directions he never intended. There was speculation about who had served as the role model for Capote’s main character when in likelihood it was bits and pieces of several prominent women he knew, none of whom were anything like one-of-a-kind Dutch aristocrat Resistance fighter war veteran ballerina doctor’s aide Audrey Hepburn, she of multinational roots and vaguely European accent and sensibilities when all the models for Holly had been 100-percent well-bred New York City American. Even when motionless for a mundane hair and makeup test, yikes. It occurred to me how unconventional was this story for 1961, never adhering to the formula of the endless stream of factory-produced romantic comedies that had come before. Literally the studios would each have a big pile of scripts and produce a story, and then the script would sink back to the bottom of the pile and get pulled out and made again every so many years; this had gone on for decades, but this strange story by the strange little author was different. Offbeat, infantile in places, adult in places, and then out of left field Holly’s husband from Texas appears and explains that Holly was once a barefoot hayseed and you’re like, suuuuuure she was. I can see Audrey Hepburn as that. 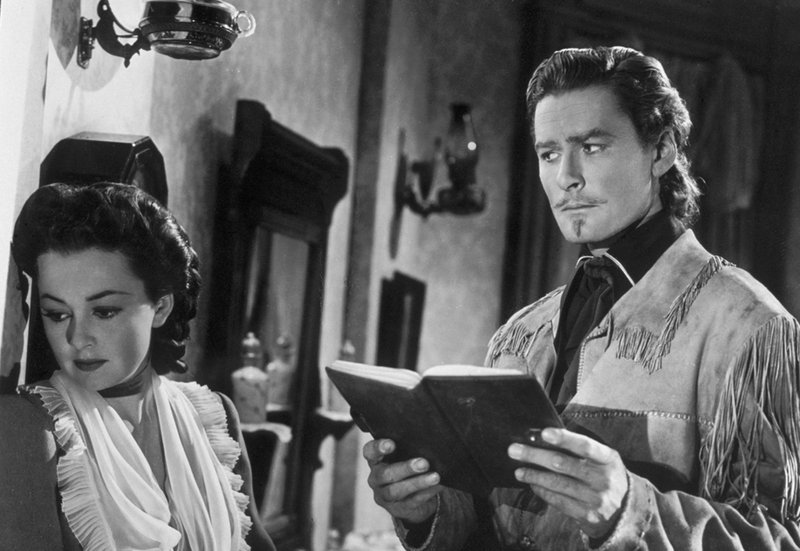 Because it was so different, I don’t mind George Peppard as the love interest; he was then new and different too and unlike the string of conventional golden era leading men cast against the Dutch baroness-by-birth. 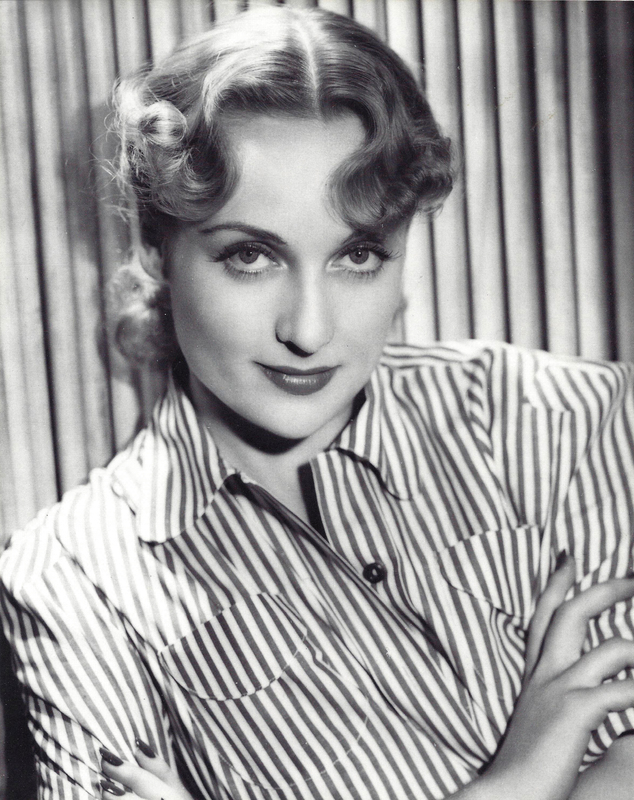 Peck had been older, as had Holden, Bogart, Ferrer, and Cooper. But here came young pretty-boy Peppard who passed the side-by-side test with Audrey even if he was cold and distant—oh, and a total sonofabitch of whom nothing good was ever said. When Audrey Hepburn doesn’t like you, and word had it she didn’t like Peppard, then you’ve got issues. Holly observes Paul with his sugar-mommy, played by Patricia Neal. Henry Mancini’s Moon River is a terrific melody. 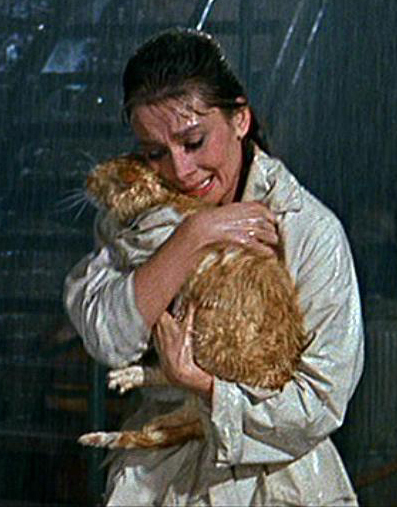 In the first couple minutes at Tiffany’s window it grabs you and never lets go to the extent I kept waiting for it to play in some variation as underscoring to reinforce Holly Golightly’s mood of the moment. Having Audrey sit on her brownstone’s fire escape strumming a guitar and singing Moon River makes no sense at all in terms of the story; she could as easily have hummed it brushing her teeth and the effect would have been the same, but no, she sang it. 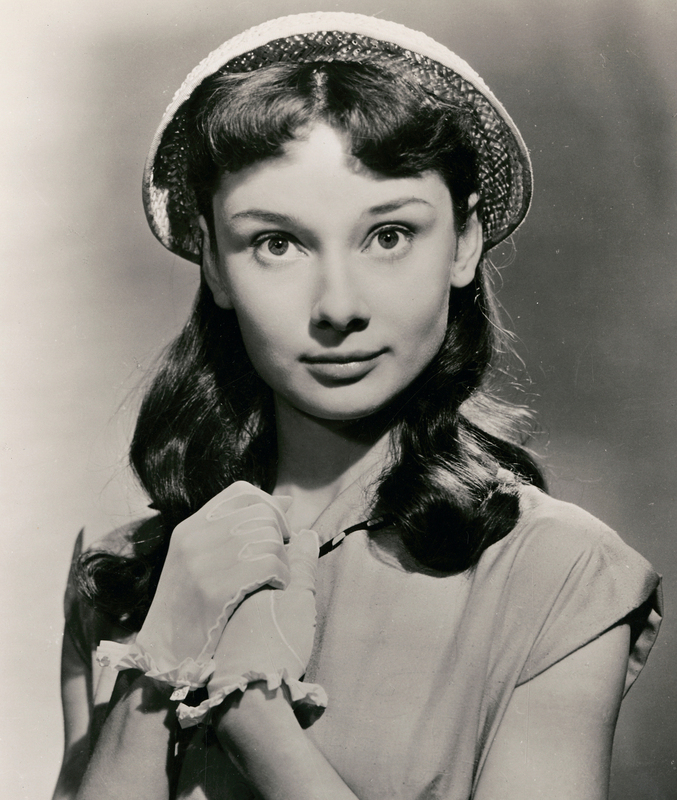 What’s telling is that Audrey Hepburn had been around music her whole life, not as a singer but as a dancer. Her comfortableness with music shows in the way she sings the song. The two drifters in the lyrics are Holly and Paul, both bought and paid for and making their way in the concrete jungle, but, um, the huckleberry friend? I read it’s a reference to Huck Finn of Mark Twain fame and I guess that makes huckleberry about wide-eyed adventurers? I don’t like it in the song. The word huckleberry doesn’t roll off an aristocrat’s tongue, and at least for me it broke the illusion of this woman sitting there singing this song. Even if the situation of Audrey Hepburn on a fire escape with a guitar is ridiculous, which it is, it all works until she sings the word huckleberry and then it took me a while to get back into the story. At a later viewing she quipped that couldn’t imagine abandoning a cat as Holly did. Although the reunion was pretty spectacular. Audrey was at this time 32. 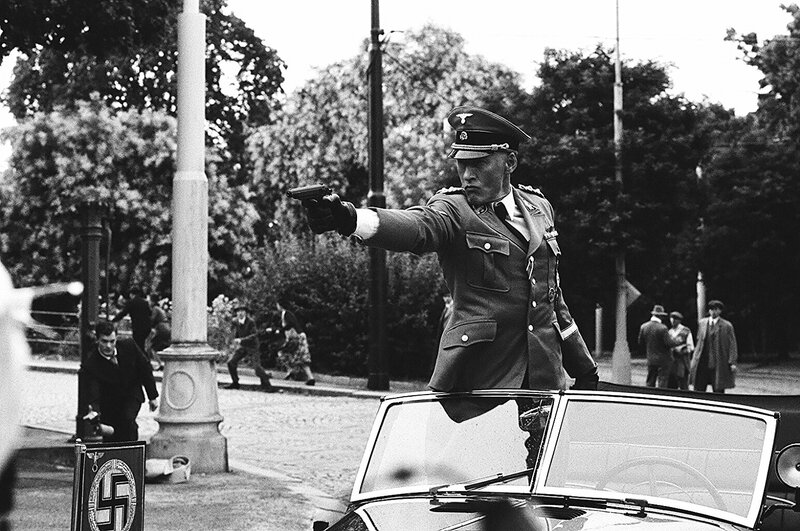 She had been out of the war for 16 years, and I want you to think about what you were doing at the beginning of 2003 and that’s how close to Hitler’s oppression Audrey Hepburn was as she portrayed Holly Golightly. Even past the turn of 1960 she was dodging questions about the war as she would always dodge them. She could bob and weave like a prizefighter and steer clear of any interviewer’s probing that she didn’t like, and there were many questions about the war she wouldn’t or—she felt—couldn’t address. Acting on location in New York City in that story wearing those clothes is as far away from war-torn Velp as she would ever find herself, and yet the war cast a shadow in which she would forever walk. 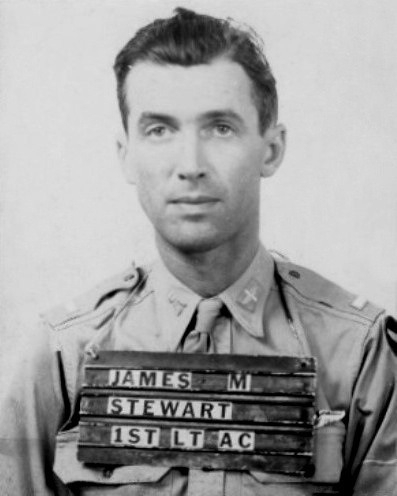 Throughout her career she appreciated every perfectly tailored dress on the wardrobe rack because she had survived to April 1945 in clothes that were threadbare and would always remember after liberation walking into a room that was piled high with clothes that had been donated by the people in America “who must be rich,” she thought. Quibbles aside, knowing what Audrey had endured earlier as a disease-ridden duckling in a steady rain of bombs made two hours with 1961’s beautiful swan in a steady rain of, well, rain, a magical experience. This morning, Audrey Hepburn’s son Luca Dotti announced in Variety a new dramatic television series about his mother’s life that will begin shooting in 2020. The Rome-based production company, Wildside, has a wealth of experience, including success with the series The Young Pope and My Brilliant Friend, which has recently been renewed. Wildside is in growth mode, which can only benefit a project about Audrey. A TV series that digs into what Luca calls Audrey’s “formative years” could rip your guts out without ever straying into embellishment. She lived through a war, and those big brown doe-eyes saw it up close. She provided thousands of words about her wartime experiences to interviewers, and the amazing thing is, she kept most of what she experienced secret, “under lock and key in her heart,” as Luca put it. As she was raising him, he always sensed there was a lot she wasn’t revealing, and he was right. 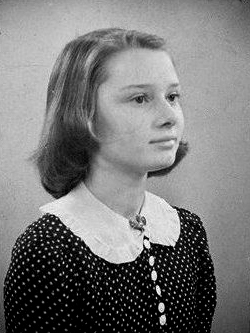 Audrey at about the time she started working for the Dutch Resistance. I have to believe an unknown talent is about to explode onto the scene playing Audrey. Casting is still a ways off, but Audrey’s story really started when the Nazis invaded the Netherlands just after she had turned 11. This fact will call for the casting of a gifted young actor who could conceivably grow through the seasons of the series. Or do you cast a different actress each season, as in Dr. Who? The dramatic demands will be harsh. 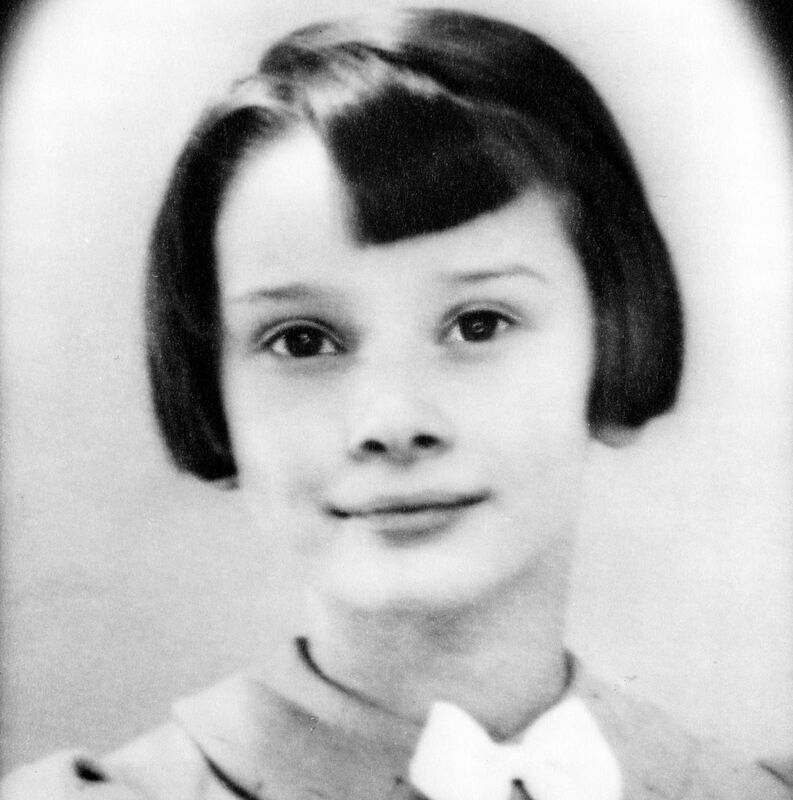 At 11 Audrey took up ballet and developed iron-willed discipline; at 12 she danced in public for the first time; at 13 she lost her first family member to the war; at 14 she risked her life to work on behalf of the Dutch Resistance; at 15 she was stepping over body parts in the streets and nearly dying of disease. And we haven’t even gotten to the secrets yet. Casting of Audrey’s mother will likely draw interest from A-list actresses because it’s a plum assignment for many reasons. 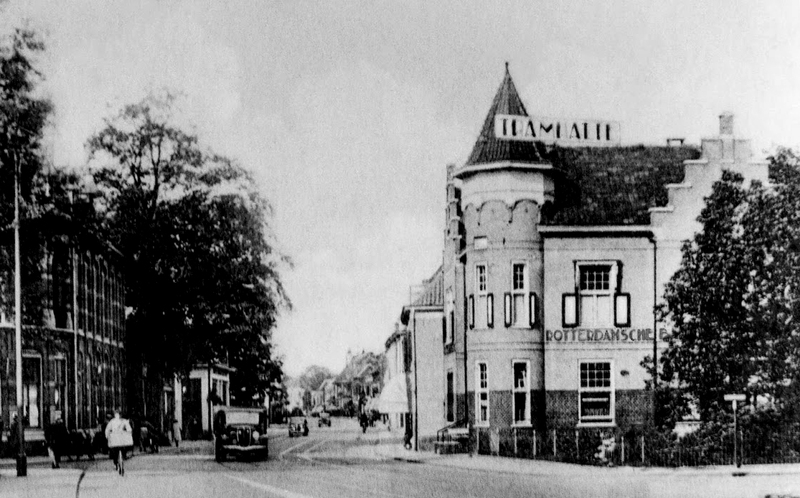 Ella van Heemstra was many things—socialite, partyer, provocateur, and rebel, not to mention a vibrant woman with a wicked sense of humor who inspired a lifetime of love and loathing in her daughter. It won’t be an easy relationship to capture in screenplay form or render on film. Luca Dotti himself was one of two authors of the draft treatment that serves as a starting point for the as-yet unnamed TV series. 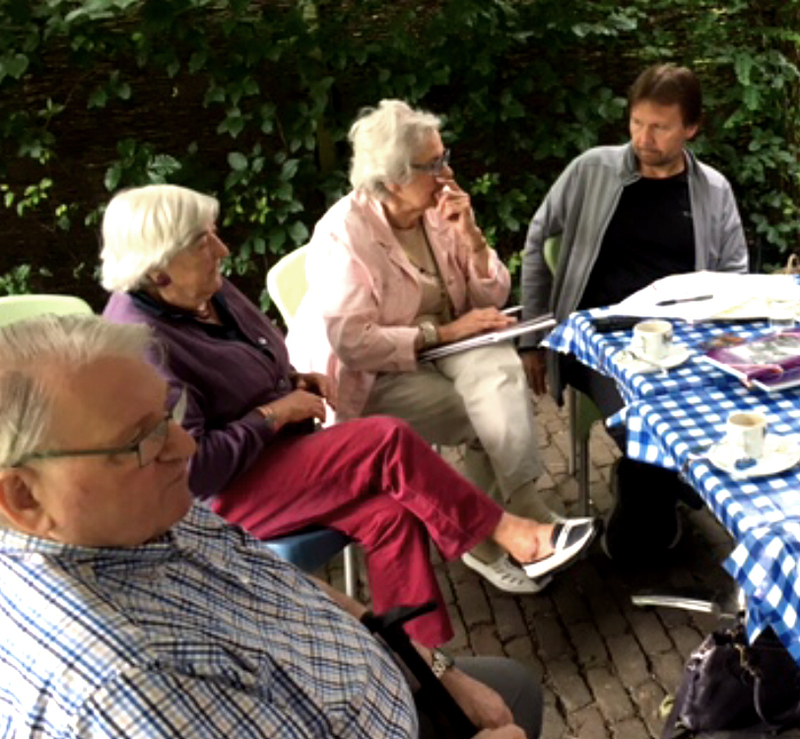 In 2016 and 2017 he was involved in development of an exhibit at the Airborne Museum in Oosterbeek called “Ella and Audrey” about the years of Audrey Hepburn and her mother in Arnhem and vicinity under Nazi occupation. He and I have talked about his deep desire to do his mother’s story justice, so I feel the conceptualization is in good hands. I’m as anxious as anybody to see the plan evolve and learn the scope of the production, including shooting locations. Today’s announcement is just the beginning of what is sure to be an interesting 18 months leading up to when cameras roll. 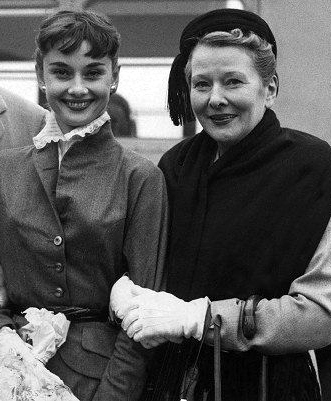 Audrey and Ella in 1953.